Please read the edit footnote. IndiGo today received its 100th Airbus A320 from Hamburg, Germany – one of Airbus’s three presently operational assembly lines. The aircraft, bearing manufacturer serial number 6336, and registered as VT-IAY, was ‘delivered’ to IndiGo yesterday (3-Nov), at around 2300HRS IST (1730 UTC). IndiGo flew the aircraft from Hamburg (Germany) to Istanbul (Turkey), and after a brief tech stop (for refuelling), continued to Delhi. The aircraft landed at 0900 HRS IST (033UTC). This aircraft marks the completion of the first order of airplanes IndiGo had placed with Airbus, on 16th June 2005, during the Paris Airshow. Back then, IndiGo was just a name. However, even as far back as in 2005, IndiGo had done its homework well. Not many times does Airbus praise a yet-to start airline with words such as, “IndiGo is the result of extensive analysis and planning by very experienced airline executives and we are convinced it will be a successful new player in a market that is both large and fast growing". These words were spoken by the then Airbus President and CEO, Noël Forgeard. IndiGo today has survived as the only airline in India to consistently report profits over the last six years, and stands to witness the completion of a massive order of aircraft. The airline firmed up an order for 180 Airbus A320s on 22nd June 2011, for 150 A320NEO and 30 A320CEO (current engine option) aircraft, making it one of the NEO’s launch customers. On 15th October 2014, IndiGo signed an MoU for 250 A320NEO aircraft. As covered first by The Flying Engineer, IndiGo will short term lease A320 aircraft from ailing Tiger Airways. Almost one year after placing an order for 100 aircraft – in June 2005 – IndiGo received its first A320 on 28th July 2006. The airline commenced operations on 04th August 2006 – 11 days before the completion of India’s 59th year of Independence, and just 6 days after receiving its first aircraft. All the aircraft since day one have been directly delivered to the airline from Airbus. Till date, the airline has not flown an aircraft that was previously used by another operator. The airline has engaged in sale-leaseback deals for each of its aircraft. The early lease agreements were for about six years (see adjacent graph) – a period just long enough to make the most of a brand new, efficient Airbus A320, while escaping the costly ‘D’ check. Lease agreements have been revised this year to extend the lease to 10 years, in view of IndiGo’s plans to aggressively add capacity to take on the Indian market. Anomalies have existed in the airline’s aircraft lease. Of the 16 aircraft that have been returned, five flew for the airline for a period ranging from as low as three months to 1 year 5 months (see adjacent graph). Three of these aircraft are today being flown by Etihad, the same airline IndiGo is losing a large number of pilots to. Of the 84 aircraft in operation, almost quarter the fleet size is between two to three years old, and another quarter between two to one year old (see graph). This shows that nearly half the fleet size was inducted in the last two years. Interestingly, it is two years since Kingfisher airlines stopped all operations, and nearly 60% of the fleet – almost 50 aircraft- was inducted since then. IndiGo expanded fast enough to grab the void in the market that Kingfisher left behind, to today command the largest domestic market share, which is upwards of 30%. On average, every 35th Airbus A320 produced since 2006 has been delivered to IndiGo. On average, the airline has received one Airbus A320 every month. Interestingly, though, the airline, for 120 days – between 1st April 2014 and 30th July 2014 – did not receive any aircraft (see graph above – red arrow). It is the longest gap between aircraft deliveries in the history of the airline. The yearly frequency of aircraft joining the airline has not been consistent. (See adjacent graph). The graphs also show that the 6 year lease, which was in effect earlier, has been extended since early this year. IndiGo had to adopt five different registration series to cater to its 100 aircraft. Of these five series, only three – the IN, IE, and IF series have had all the English alphabets as the third letter. 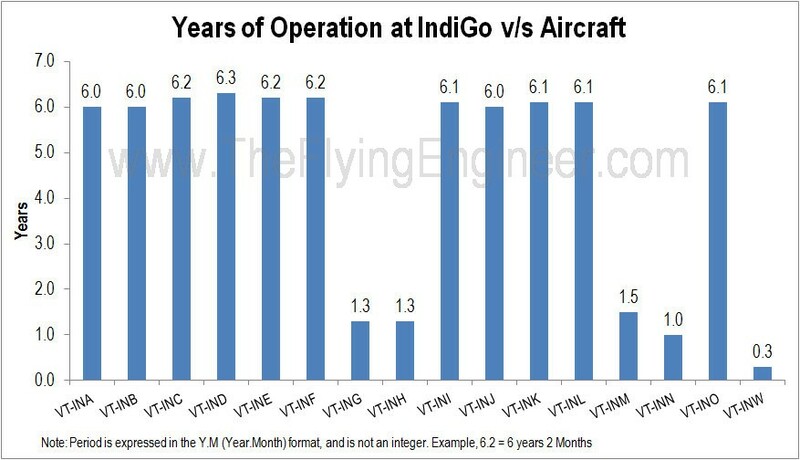 All 16 aircraft that have left IndiGo’s fleet were from the IN series. Sharklet equipped A320 aircraft at IndiGo started in the IF series, with VT-IFH. VT-IFH was the first shraklet equipped A320 in India. With Airbus’s continuous improvement to the A320, every series has something unique, with some changes that may not be noticeable from the outside. For example, VT-IAP onwards, all A320s have a smooth nose, with the lightning strips now embedded in the nose cone (see image comparison below). This helps reduce aerodynamic drag. With 30 Airbus A320CEOs still in the order book, IndiGo may sustain the induction of 1 A320 a month for the next 2.5 years atleast. Tigerair’s 12 A320s may be used to boost capacity till such time IndiGo’s target fleet size with its own aircraft is reached. With Airbus’s initial A320NEO production rate set to be slow, deliveries of a mixture of A320CEOs and A320NEOs may start late next year, with mixed deliveries running perhaps into 1.5 years, as Airbus gradually boosts production rate (with its new FAL at Mobile, Alabama) and transitions to an A320NEO line from the A320NEO and CEO mix line. However, conversion of some of IndiGo’s A320CEO to NEOs is expected. Thanks to Oscar Victor for certain info. Edit, thanks to Shakti Lumba: Airline’s first aircraft delivery changed to July from June, 2006. Start of operations corrected to 4th August, 2006 from 15th August. Very nicely researched article Vasuki. Good graphics. Congrats and thanks.